Your presence on this tutorial itself reflects that you’re an avid Magento fan. Well, if you’re looking forward to switch to a better checkout utility for your Magento powered e-commerce website, then PayPal can turn to be a good choice. This is what I’m going to look into in this tutorial. 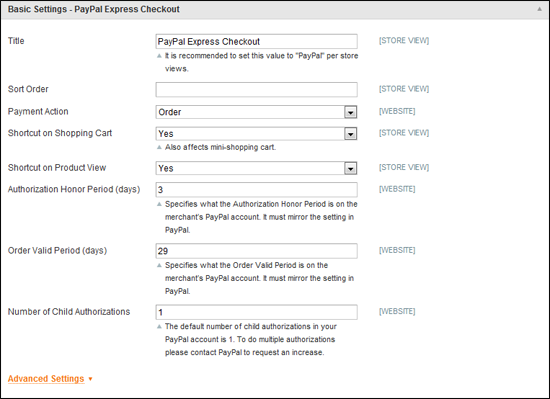 Read on to find how you can configure PayPal Express Checkout for your Magento e-store. Why choose PayPal for your Magento store? Unlike a wide range of payment gateway service providers, PayPal doesn’t charge you any fee for adding its service to your website. That means, you are not required to pay any additional fee for customizing your site code for integrating payment transactions etc. Making online payments via PayPal is a more straightforward and secure process. All you need to do is simply provide PayPal your name, country, address, contact number and email address with acceptance of the PayPal user agreement. Moreover, encrypting the data sent to and from your web-based store isn’t an issue with PayPal. You just need to click on “Yes” to the PayPal encryption button and you’re done. Once you’re done with making the above alterations, click on “Save” button. Email Address- Use this textbox to enter the email address exactly similar to the one entered during the creation of PayPal merchant account. API Authentication Methods- Use this dropdown to select the API Certificate applicable for your Magento e-store. API Username- Use this textbox to enter the username for the API application method chosen above. API Password- Use this textbox to enter the password for the chosen API application method. API Signature- Use this textbox to enter the API Signature applicable for your online store. Apart from entering credentials for the above mentioned fields, you can choose to click on “Get Credentials from PayPal” button to get the above fields auto-filled with values available for the created PayPal account. If you’re working in Sandbox, click on “Sandbox credentials” , followed by setting the “API uses Proxy” dropdown to “Yes” and inputting values for Proxy Host and Proxy Port. Finally, set the “Enable this solution” dropdown to “Yes”. Title- Use this to enter a title for the payment mode(here, PayPalExpress Checkout). This title would be visible to users during the checkout process. Sort Order- Use this textbox to set the location of PayPal amongst a wide array of other payment gateway options available for the buyers. Payment Action- Use this dropdown to select the user payment actions for which Express Checkout would be applicable. You can choose from options viz: Authorization, Sale or Order. Shortcut on Shopping Cart dropdown- Set this dropdown to “Yes” for making the “Checkout with PayPal” button visible on your shopping cart. Shortcut on Product View dropdown- Set this dropdown to “Yes” for making the “Checkout with PayPal” button visible on Product Details Page. In addition to above, you’re also supposed to enter values for fields viz: Authorization Honor Period, Offer Valid Period and Number of Child Authorizations. Once you’re done with filling in the Basic Settings form, click on “Advanced Settings” link to reach the PayPal Advanced Settings Page(I’ve covered the same in my next step). Payment Application Form- Use this dropdown to select the countries whose customers would be able to view the PayPal Payment Application form. Debug Mode- Set the value for this dropdown to “Yes” if you want to set the logs for all payments made via PayPal Express Checkout. Enable SSL Verification- Set the value for this dropdown to “Yes” for enabling SSL Verification for all transactions made via PayPal Express Checkout. Transfer Cart Line Items- Set the value for this drop-down to “Yes” if you want to display the complete details of customer’s order. Transfer Shipping Options- Set the value for this drop-down to “Yes” if you want Magento to transfer the cheapest shipping options under a situation where the count of products available in the checkout exceeds 10. Shortcut Buttons Flavor- Set the value for this drop-down to “Static” if you want to display a single image for your PayPal Acceptance button. Or else, you can set it to “Dynamic” for being able to change this image using the PayPal server. Require Customer’s Billing Address- Set the value for this drop-down to “Yes” if you want PayPal to use the customer’s billing address for allowing him/her to make a payment. 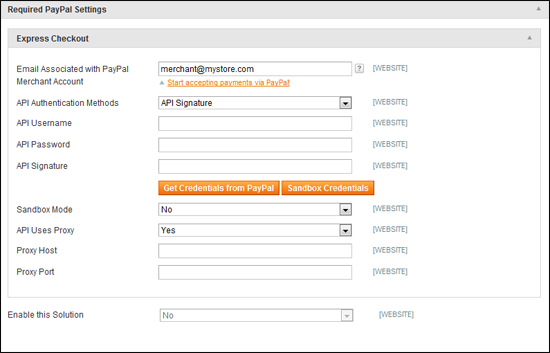 Here, ensure to get this feature activated first for the PayPal merchant account. Billing Agreement Signup- Use this drop-down to set the creation of billing agreement in case of zero active billing agreements. Select “Never” if you don’t want the billing agreement to be created. 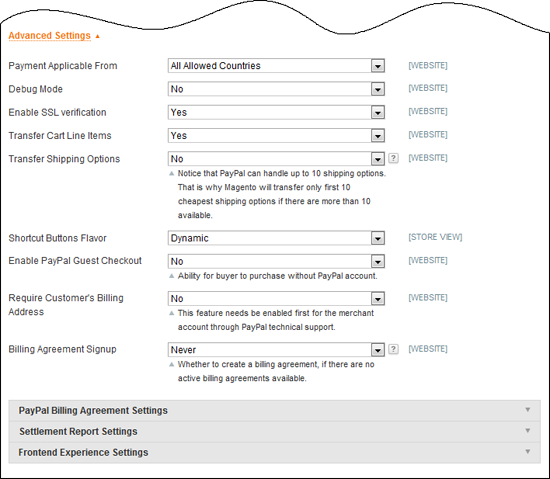 Select “Ask Customer” if you want PayPal to ask the customer about the generation of Billing agreement. You may also select “Auto” for enabling auto-generation of the Billing Agreement each time a customer intends to make a payment via PayPal Express Checkout. In addition to above, you can expand the labels viz: PayPal Billing Agreement Settings, Settlement Report Settings and Front-end Experience Settings for specifying your desired preferences. Once you’re done with all that, just click on ‘Save Config” button to save all the settings. Hopefully the above tutorial would have allowed you to dig deeper into integrating PayPal checkout with your Magento e-commerce site. So, get on with the steps and you’ll definitely be able to render a flawless buying experience to your customers.